Berczy Park has a special place in the hearts of everyone who lives in our neighbourhood. It could be because of its proximity to the iconic Flatiron Building, or maybe people just love having a greenspace so close to home where they can sit and enjoy the day. You’ve probably noticed that the park has been under construction recently, and that’s because our good friend Claude Cormier and his team have designed a new park that will completely revitalize the space. 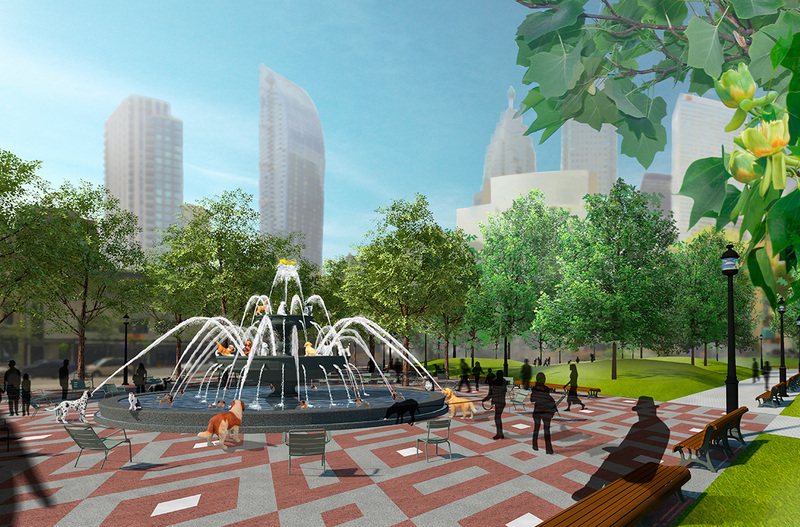 Can you talk a bit about your design inspiration for Berczy Park? Berczy Park was first built in the early 1980s and since then it has been extremely loved by the people living in the community. That big love has inspired our design process. Our process was to engage the community and consult them on what the park should be like, so we consulted and informed them as we went along. We realized early on that lots of families with kids were living in these new high-rise developments and these new families living downtown want the park for their kids to play. But, there are also other groups of people, like single people with dogs who want to have the park for their beloved dogs – there are around 2,000 dogs that visit the park every day. The Business Improvement Area also wanted the park to suit people who are visiting the neighbourhood or those who live or work there and want to use the park for their leisure – to linger, to sit in the park, to eat their lunch, to use it for events, and more. We have three different types of user groups with different needs and understood that we have to incorporate what each of them want into the space. Furthermore the trees that were there before didn’t grow very well and weren’t healthy. We wanted to keep the same spirit of the park from before, but improve the program for all different users and make sure that we will have beautiful and healthy large trees. 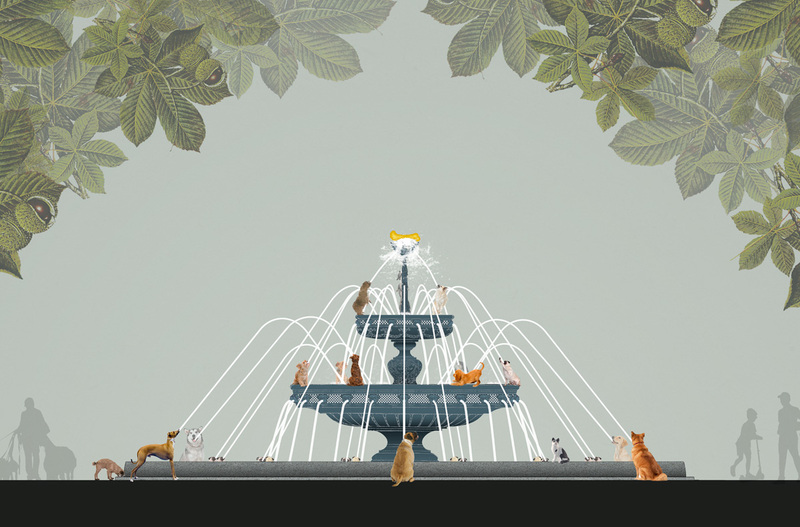 The new park is basically the old park revisited in a new way – that’s when the large dog fountain came in. It’s a playful element with a trough at the foot of the fountain where dogs can drink fresh water out of, a space for dogs to go and “do their thing,” and another area for kids to play. There are 27 dog statues, a cat, two birds, and big bone on top of the fountain. Why one cat? During the process people kept saying it was all about the dogs, so I decided to bring in a cat! It’s playful, kids will play and interact, dogs will drink, and people will be able to watch it all happen. It will be a very active park. Does any part of your design play off of the iconic Flatiron Building? We’re taking the Flatiron Building mural into consideration for the composition of the park, yes. It’s a focal view, and when you’re coming from Scott Street along the new pathway there will be a criss-cross pattern of pathways that actually engages visually with the mural. We have a very strong paving pattern which is reminiscent of the neighbourhood’s historical red brick and grey stone buildings. 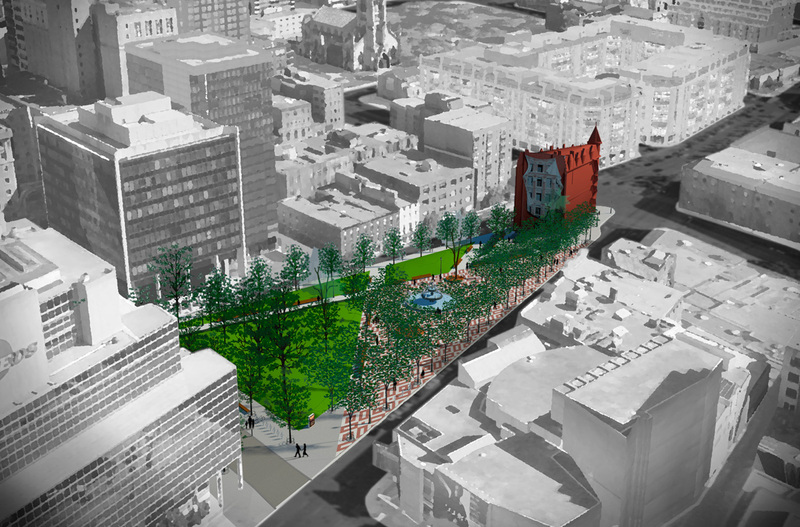 When can we expect to see Berczy Park complete? The park is currently under construction and we should have it completed by Fall 2016. Berczy Park has the soul of the old place, but it’s been revisited for people who are now living in the city – all types of people. There will be free standing furniture, lots of benches, lots of peoples, kids, dogs, tourists in a lively green space, either in sunny area and shadowed by beautiful trees. It’s going to be great.